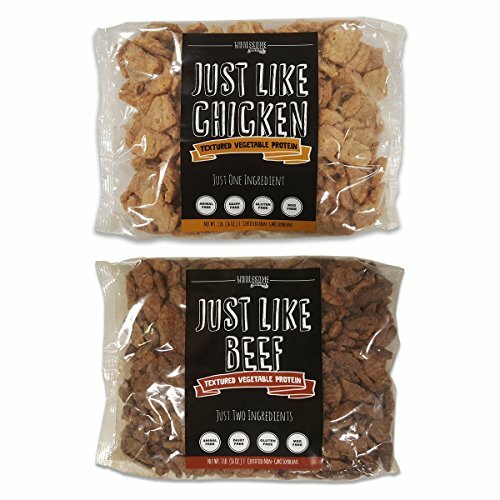 Just Like Chicken and Just Like Beef from Wholesome Provisions is 100% Vegan meat substitute/meat analogue and is made entirely in the USA. Sourced soybeans are certified Non-GMO - only the highest grade soybeans are used. Just Like Chicken and Beef is quick and easy to prepare and highly versatile. 100% Non-GMO Certified Soybeans. Made in USA. All natural and premium grade. ONLY 1 TO 2 INGREDIENTS. Amazing texture. TVP IS UNFLAVORED, season and/or marinade as preferred after reconstitution. Absorbs sauces and liquids. Highly versatile for use with hundreds of recipes. Great for stir-frys, pastas, stews, soups, pot pies, sandwiches, salads, and so much more. If you have any questions about this product by Wholesome Provisions, contact us by completing and submitting the form below. If you are looking for a specif part number, please include it with your message.